Boston-based Brigham and Women’s Hospital created a web-based handoff tool and trained its employees in an effort to reduce medical errors. Now researchers are reporting that they have seen lower medical error rates as a result. This report comes a few months after a new study in the British Medical Journal (MBJ) claimed medical errors lead to the death of 251,454 people in the United States every year. Medical errors can include things like medication errors, unnecessary treatment, misdiagnosis, delayed diagnosis, incorrect use of an intravenous line, infections, and other problems that harmed, or could have harmed, a patient. You may remember that earlier this year, Brigham and Women’s Hospital also launched Safety Matters. It’s a blog aimed to describe mistakes made at the hospital along with steps the hospital is taking to prevent them. Brigham and Women’s Hospital recognized that during shift changes, also known as handoffs, were prime opportunities for key information about a patient’s condition to get lost in the shuffle and for the possibility of a medical error to occur. To improve communications during patient handoff the tool was created. The web-based tool scans a patient’s electronic medical record for the information that doctors and other health workers need to know most. Then it automatically pulls that information into a separate page that’s been designed to highlight those essential details. Researchers surveyed residents on the various shifts starting November 2012 before the tool release in February 2013 and continued throughout the year that followed. The survey examined more than 5000 patient cases. The result: The number of medical mistakes was cut in half the year after the hospital introduced the software tool and taught employees how to use it. There were 77 errors identified between November 2012 and February 2013, compared with 45 in the following year. 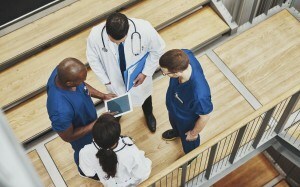 Some argue the results should not be viewed in isolation and state that this effort would require a lot from the hospital, its employees and vendors to improve workflow and patient safety and to make sure they are integrated into their specific systems, not to mention the process, communication, training and new technology that would be required. While the tool is unique to Brigham and Women Hospital and is integrated into their existing systems, some hope that other hospitals and healthcare facilities may adopt a similar strategy. New research is showing that adding technology to the hospital team helps to make health care safer.